Hornady's low-recoil critical defense adds four new calibers. These expanded 9mm Critical Defense bullets were retrieved from (l.-r.) bare gelatin, light clothing and heavy clothing. That's the consistent performance Hornady touts in these low-recoiling loads. In law enforcement circles, the "Newhall incident" was cause for a change in training. Four California Highway Patrol officers lost their lives in a shootout with two criminals. Among the changes that came about was dropping the idea that one could train with low-powered ammunition (through the 1960s, CHP commonly trained and practiced with .38 Special ammo but carried .357 Magnum on duty) and that such training would be sufficient when you later used full-power ammunition. Nearly 20 years later, the FBI started testing ammunition for terminal performance to preclude future shootouts such as occurred in Miami (see October/November issue). There was one problem: The FBI set the bar very high. While the ammunition manufacturers have been able to exceed the agency's demands (bullets must pass through window glass, walls and other obstacles and still penetrate a foot in ballistic gelatin), to do so cost us a lot: a lot of noise, recoil and wear and tear. As a result, we end up with ammo such as a .45 ACP round featuring a 230-grain bullet at 950 fps. Or a .40 S&W with a 180-grain jacketed hollowpoint at mach 0.95. I can truthfully say I make my living shooting, and I've shot a lot. I've blasted with big guns and small, hot loads and soft, and I'm pretty inured to recoil. But even I do not find such performance enjoyable out of a compact carry gun. Hornady stepped into the situation with its new bullet and load, Critical Defense. The idea was simple: Unless you were certain you were going to be duking it out with bad guys in a cluttered environment, with cars and doors and walls and windows in the mix, all you needed was ammo that performed properly against light or heavy clothing--not so much the clothing but the bad guys wearing the clothing. 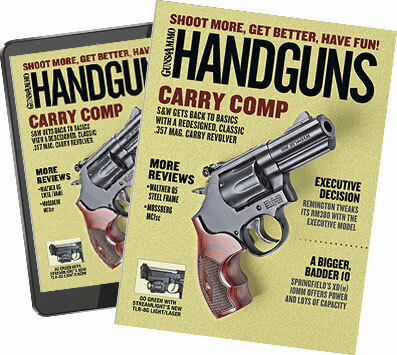 And considering the number of concealed-carry permit holders who have elected to carry the smallest and lightest handguns possible, the .38 Special and .380 Critical Defense loads were, wisely, the first offered by Hornady. We knew other calibers would follow. The newest additions to the Critical Defense line are .357, 9mm, .40 and .45 ACP. With these, we can expect more performance as compared to the .38 and .380, while having to put up with less. Which is what we get. I started with the .45 ACP, since that was the first handgun to surface in the pile of guns I had in the truck. With a limited supply to work with (I managed to acquire two boxes of each caliber from Hornady one day past the R&D stage) I simply fired over the chrono and into the gel (bare gelatin and with light and heavy clothing). I didn't have enough to spare for accuracy work, but Hornady ammo has always proved accurate, so I wasn't concerned. The results were gratifying. The .45 ACP ammunition is soft in recoil, which is no great surprise when you look at the velocities. Also, the shorter barrel had greater penetration. Again, no surprise there. Any given bullet that is loaded to strike with greater velocity will inevitably have greater expansion and thus less penetration. I tested the .45 in both a compact and a full-size pistol, and both performed admirably. By selecting a 185-grain bullet, Hornady has decreased felt recoil while still maintaining velocity and penetration. In the .357 I used a classic and standard carry revolver, and the results were also gratifying. By using a 125-grain bullet and not trying to reach low earth orbit velocities with it, Hornady again keeps recoil under control while delivering expansion and penetration. I fired the last of my limited supply from a three-inch .357 and had no problems with muzzle flash or blast. The .40 was a particularly difficult test because I used an ultra-compact pistol to slow down the bullet as much as possible. However, Hornady clearly anticipated this option, as the .40 performance is the equal of the other calibers. In 9mm, I used a common-size carry pistol and had a chance to check the Critical Defense load against an old-school jacketed hollowpoint. Interestingly, the old-style 115-grain classic JHP performed in an exemplary fashion. This load, the same weight as the Critical Defense, was about 100 fps faster, penetrated three inches less but expanded to .630 diameter--as opposed to the Critical Defense's .520. However, the expansion, penetration and especially the retention and straight-line ballistic gel track were not typical for old-school loads. The Critical Defense performed as well or better, and it will do that all the time. You may be asking yourself "If this isn't velociraptor-slaying ammo, why should I use it?" Simple, and if I'm repeating myself, I have reason to: It does not have heavy recoil. I recently tested some ammo that is fully FBI-compliant. I tested it on a car, where it went through the windshield, test target, driver's seatback, rear seatback, trunk partition (two struck cross-members of the body), and one of those three rounds even exited the trunk. To do that, the maker had to boost .40 caliber 180-grain bullets up past 1,000 fps. Even in a full-size gun it was not fun shooting. To shoot that ammo in an ultra-compact pistol would be miserable work. If that's what you have, you won't like practicing, and you won't practice much. Or, if you do practice with lighter ammo, you won't be ready for the noise and recoil of the full FBI-spec load. And if you find yourself in a defensive situation, you will not perform well with the hotter stuff. We know this from Newhall. What the Hornady Critical Defense (known on the ammunition box end-flap as "FTX") does for you is delivers near FBI-spec performance with the recoil and muzzle blast of practice-level ammunition. You get the terminal performance of the velociraptor-slaying load without the sturm-und-drang of the FBI-spec ammo. In the case of Hornady Critical Defense ammo, you get something for almost nothing.